Back in the heyday of music rhythm games, MTV paid Rock Band-makers Harmonix $150 million in performance-based compensation and now it wants that money back. It was 2007 and it seemed everybody was talking about Rock Band and Guitar Hero. You couldn't walk down a street in Manhattan without seeing kids and adults alike strumming on plastics guitars and banging on fake drums in storefronts and apartments. 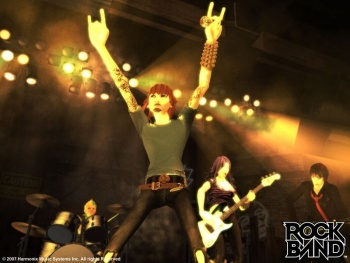 Rock Band sold over a million units in its first month of release and the franchise has earned over $1 billion overall. But, as we all know, such glory days were meant to fade like the career of an aged rocker. The sales of expensive bundles like The Beatles: Rock Band have cooled and MTV is trying to collect on some of the cash it gave Harmonix based on how well the first Rock Band sold. In 2008, we paid $150 million, subject to adjustment, under this earn-out agreement related to 2007 performance. At December 31, 2009, we believe that we are entitled to a refund of a substantial portion of amounts previously paid, but the final amount of the earn-out has not yet been determined. It seems disingenuous to try to take back someone's bonus, but that appears to be exactly what Viacom is doing. Just because the sales of rhythm games has slowed doesn't mean that they didn't move a buttload of units just a few years ago. By all accounts, Viacom still made money on the deal. What gives? More importantly, does this foretell a bigger shift in the videogame industry? Will we see parent companies reluctant to take risks on new music games? Is this filing by Viacom the first harbinger that the Rock Band is era is over? Nah, I'm just kidding. But it does seem bleak.